[For those of you who don't know how English verse works: "wandered" is pronounced wandered not wandered and "lonely" is pronounced lonely not lonely. So you naturally say "I wandered lonely as a cloud" in a te-Tum te-Tum te-Tum te-Tum rhythm, which is called an iambic tetrameter because there are four (tetra) iambs (te-Tum). Got that? The same goes for a lot of normal sentences "A cup of tea" will always be "A cup of tea" because "a cup of tea" would just sound weird. My mistress eyes are nothing like the sun. Now here's a funny thing: blank (unrhymed) verse is never, ever written in iambic tetrameters. For some reason, the human brain adores even numbers. Nobody knows why. But we love even numbers so much that we will unconsciously insert a pause to make an iambic pentameter last as long as a hexameter would. Always the pause. This does not, of course, apply to tetrameters, because you have an even number of feet. When you're reading a tetrameter you go straight from one line to the next. The only thing that marks the line endings is the rhyme. Now imagine if there weren't any rhymes in that Wordsworth poem. A listener would not know where the lines ended. This is a tetrameter so you have no pauses. The rhymes were the only markers of the line-endings. If a tetrameter doesn't have rhymes then it's just te-Tum te-Tum te-Tum te-Tum te-Tum te-Tum te-Tum te-Tum te-Tum te-Tum te-Tum for ever. That's why unrhymed verse has to be written in a meter with an odd number of feet. But what if you have four and a half feet? There, my dear, is the beauty. The mind of an Englishman requires four full feet, so if he is denied them he will insert a pause. If he is denied them by only half a foot, he will insert a half-foot pause. This creates a verse form of heart-breaking delicacy. Its most exquisite incarnation is Auden's Lullaby. And thus can you write blank verse in tetrameters. The tiny pause has none of grandisonance of the kingly pentameter. It is so small as to be almost a stumble. A hesitation. And in that the meter finds its beauty. A snowflake would be rather dull if it were as big as a dog, but because it is so small the detail is beautiful. Anything miniature is beautiful. It's an iambic tetrameter, yet it's missing its head which means it's acephalous. "But wait a minute," I hear you cry from your lonely pantry, dear reader, "couldn't you just as easily call it a footless trochaic tetrameter?" The iambic rhythm is so firmly established that you read it gently. Auden also uses this meter elsewhere. But in both cases the rhyme detracts from the meter's natural delicacy. As a means of writing blank verse the acephalous iambic tetrameter is scandalously underused. Now go and read Lullaby, it's better than whatever you had planned. Here is a link. The poet Neil Curry suggests it's no accident that metre is measured in feet. If one gets stuck in ones poeting, a walk will usually sort out the problem. One of my poems was read at a funeral recently, and although I was comfortable with it in my head, it wasn't until I heard the words spoken by someone else, that I was happy with it. I can see how Moptop's suggestion of walking would work. Is it bad that I'm trying to write poetry and have no clue about any of this? Ha. That was fascinating - thanks! The weeing image confused me, I think because my first reaction associated it with excitement, not with fear. I wondered why I shouldn't read on, despite being both excited and afraid. I think the sandwiches containing spagetti, tomato sauce and hundreds and thousands are scarier, though. With regard to walking, I once participated in an extremely fun and funny exercise which involved wandering Christ Church's Peck Quad in proclaiming Shakespeare's sonnets, and subsequently some speech-y type bits from the plays. Entertaining and really did help sort out the meter. It also meant you could play with slowing up and speeding down by focussing on walking speed and seeing what happened to the text. Very interesting analysis, but I think you are mistaken that this is blank verse using acephalous iambic tetrameter. 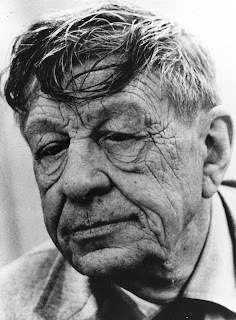 Auden uses many slant rhymes in Lullaby and, to my ear, he establishes this rhyme pattern for each of the ten-line stanzas: ABCBADCEED. Read it again and listen closely for those slant rhymes!